This Christmas, you can look forward to gathering your friends and family for a heartwarming trip to the movies. There you can watch the masterful Quentin Tarantino‘s The Hateful Eight unleash what’s sure to be a violent, blood-soaked trip to the West. And it will be available in 70mm Ultra Panavision. Actually, it will only be available to see at Christmas in 70mm and wider release on January 8th. The movie stars Kurt Russell, Jennifer Jason Leigh, Samuel L. Jackson, Tim Roth, Michael Madsen, Demian Bichir, Walton Goggins, and Bruce Dern, and you can watch the first teaser trailer for the movie below. The long, sordid history of this movie is almost a movie unto itself. Tarantino at one time vowed the film would never be made after someone leaked the script in early 2014. In April of that year, Tarantino held a live script reading of an early draft of the screenplay featuring most of the actors he had chosen for parts in the movie. Based on the success and feedback of that reading, Tarantino changed his mind about not making it and now we have what will be the 8th film in the acclaimed director’s filmography. Sounds like there will be plenty of snow and blood this Christmas to look forward to. 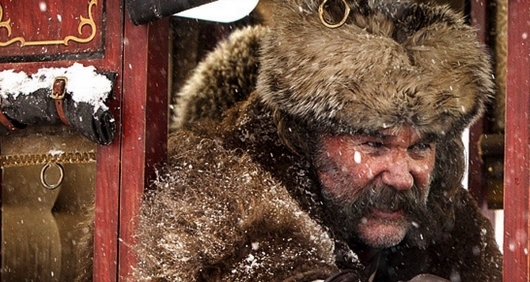 Check out The Hateful Eight in theaters (as long as they are showing it in 70mm Super Panavision) on Christmas Day. Web Series: Heroes Reborn: Dark Matters – Watch Here!